Take a look at some of our new designs embellished with sequins, crystals, and brooches. 1) Orange raw silk with gecko shaped brooch encrusted with rhinestone detail. 4) Cream cushion with heart shaped rhinestone detailing. 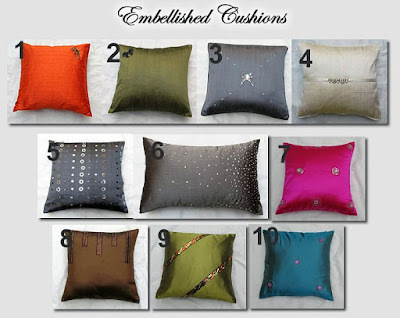 all available from Comfyheaven cushions. email: gracefullivingsrilanka@gmail.com for inquiries.